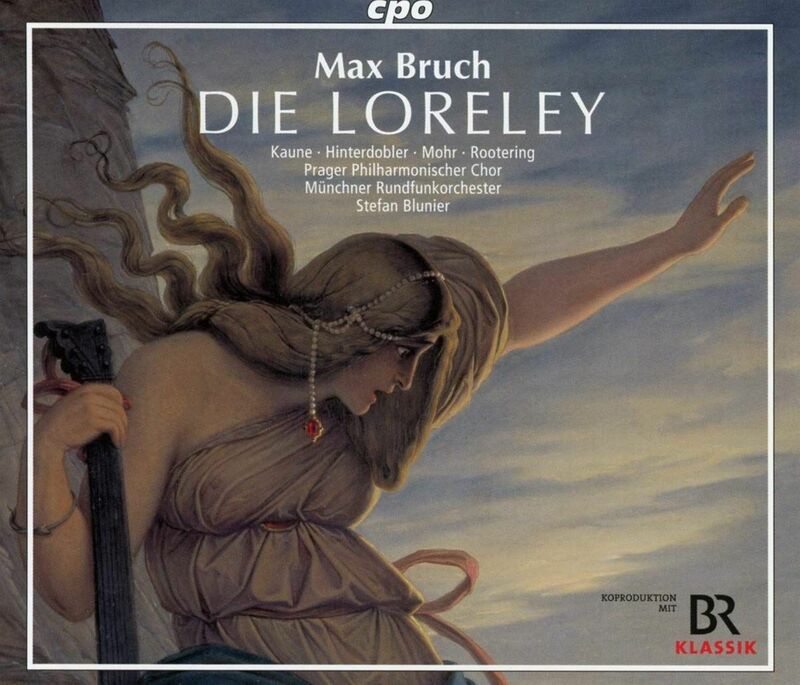 Max Bruch Die Loreley recorded live in the Prinzregenstheater, Munich, in 2014, broadcast by BR Klassik and now released in a 3-CD set by CPO. Stefan Blunier conducts the Münchner Rundfunkorchester with Michaela Kaune, Magdalena Hinterdobler, Thomas Mohr and Jan-Hendrick Rootering heading the cast, with the Prager Philharmonischer Chor. Bruch (1838-1920) may be best known for his Violin Concerto no 1, but this first ever recording of his full opera should broaden interest in his output as a whole. 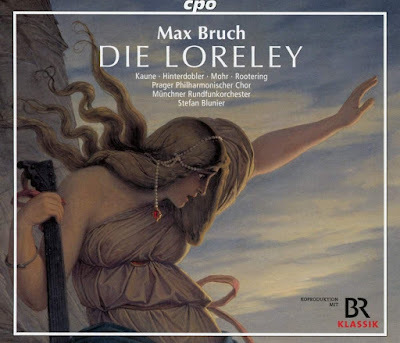 Bruch's Die Loreley is a very early work indeed, written between 1860 and 1863, and shows how the composer responded to the influences around him. The text, by eminent poet Emanuel Geibel (1815-1884), was conceived for Felix Mendelssohn, whose music Geibel loved dearly. He so identified the text with Mendelssohn that he was reluctant to give Bruch permission to use the libretto. But Bruch (in an era before copyright enforcement) was not deterred. The Mendelssohn connection is significant, because it shows the context in which the opera was written, which shapes the way in which the opera should be assessed. Far from being retrogressive, Bruch was in tune with the values of Gernan music theatre, as represented by Mendelssohn, Carl von Weber, Heinrich Marshner (whose 1833 opera Hans Heiling addresses the Lorelei legend) and even Robert Schumann. Though Bruch's Die Loreley doesn't, understandably, have the astonishing originality of mid and late period Wagner, it can be heard as a young composer's response to the "new", heralded by Richard Wagner. In the Pflazgraf's castle, the wedding feast is being celebrated with cheerful choruses. A Minnesänger, Reinald (the veteran Jan-Hedrik Rootering, still in good form) sings of love and fidelity. Otto is terrified, but no-one knows why. Suddenly, Leonore materializes, singing the song of the Loreley. Otto can hold himself back no longer and claims Leonore, raving and starting a fight among the knights. The Archbishop (Thomas Hamberger) and priests accuse Leonore of witchcrafth and have her sent, in chains, for trial. But she sings her defence so beautifully that all who hear it are enchanted. Otto still rages, and is excommunicated and driven away. Bertha dies of a broken heart. In Hubert's village, the boatmen and vintners mourn her. Otto sits outside the church , hearing their hymns but still cannot escape the curse. He heads back to the rock where he first encountered Leonore , begging her forgiveness, but she's no longer of his world, her lines plaintive and keening. "Zwischen dir und mir steht einfort eine dunkele Macht. The orchestra surges, and the Spirits of the Rhine well up around her. Their curse is fulfilled, and they claim her for their own, the "Köningin vom Rhein". Given the connection between Geibel and Mendelssohn, it's almost impossible not to hear echoes of Mendelssohn in Bruch's score, though it's clear that Bruch was responding to Wagner, with echoes of Tannhäuser, and to much else popular in the period. 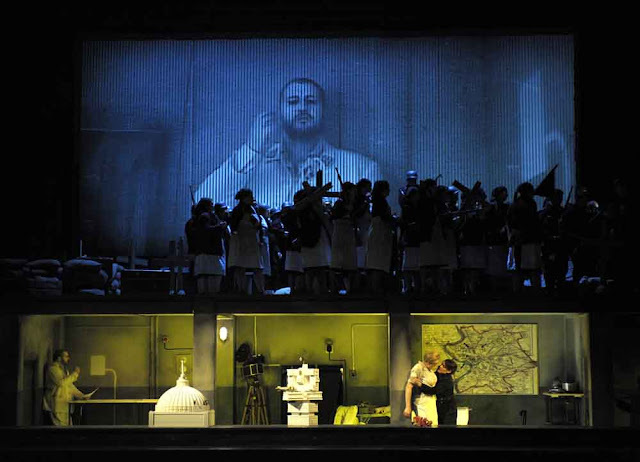 Giebel's libretto for Die Loreley is superb, so well written that Bruch can set each scene to catch the atmosphere. The Grand Scene of the Spirits, which forms the Second Act, is quite an achievement for a composer in his early 20's. Though the opera is not a major milestone, it is well worth hearing as part of the evolution of German music theatre in this period. Stefan Bunier and the Münchner Rundfunkorchester give a rousing account, which probably won't be improved upon for some time, since the opera was only recently revived in full. A good cast all round. Kaune and Mohr are particularly impressive, she at turns meek and ferocious, malevolent and wistful, epitomizing the complexity of Leonore's character. Mohr's clear tenor rings as though Otto were a hero, which he is, in a way, since he was cursed through no real fault of his own.